Almost every modern home has a refrigerator and for good reason. Refrigerators provide a safe and efficient way to safely keep our meats, vegetables, fruit, and many other foods cold and fresh. However, in order to accomplish this, refrigerators must produce EMF radiation, and I think you may be surprised at just how much they can produce. For a very long time refrigerators were fairly simple, and it was primarily the circuitry and electronics in the back that was producing EMF radiation, however, your fridge is getting smarter. You can now purchase fully connected refrigerators that not only monitor the kind and quantity of food inside but can also automatically order more food for you. They often have digital displays on the front that produce similar amounts of radiation as a tablet. All total, these devices can actually produce a large amount of EMF radiation. First, let’s talk a little bit about how your refrigerator works, and then we’ll look at the details of much radiation it is likely producing, and how you can test this for yourself! How Does A Refrigerator Produce Radiation? First, let’s talk a little bit about how refrigerators work. When these machines were first created, they used ammonia gas which was pushed through metal pipes in order to cool the units. Obviously, this was extremely dangerous as ammonia is poisonous. Later, the ammonia was replaced by chlorofluorocarbon (CFC). CFC, although not poisonous, was discovered to be extremely bad for the environment and the atmosphere, and so was later replaced with tetrafluoroethane (HFC), which is what modern refrigerators still use. When the machine reaches the set temperature, the thermocouple shuts the electricity off and stops the cycle of HFC through piping, which stops the cooling effect. This will be the on and off whirring sound you often hear from refrigerators. It is the electronics in the back of the machine that pushes the HFC through the piping that produces the largest amount of magnetic radiation. Modern refrigerators luckily produce a rather small amount of radiation. As these units have become more advanced they have also become more energy efficient, using less electricity and producing less radiation. According to the Long Island Power Authority who did a study of EMF radiation from home appliances, the average modern refrigerator exposes the body to about 1.5 mG at 1 foot or less distance, and less than 1 mG at 3 foot or greater distance. When this amount will change dramatically, is with WiFi enabled smart refrigerators like this Samsung family hub refrigerator on Amazon. If you look at the listing you can see that the unit features a large display screen showing the weather, grocery lists and much more. This is essentially like having a large tablet on your refrigerator, and this will produce far more EMF radiation than the refrigerator itself. These units often monitor the food inside the fridge, as well as constantly updating things through a WiFi connection and Bluetooth connection to your phone. The majority of the EMF radiation coming from your refrigerator will be magnetic, but it’s best to measure all three types, (magnetic, radio, and electric) to get a full understanding of the radiation. The best way to measure this is to get a quality EMF meter. 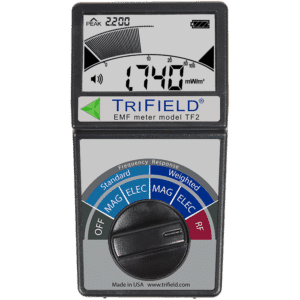 I always like to recommend the new TriField TF2 (read my review) as it’s simple to use, lasts forever, is extremely accurate, and measures all three types of EMF radiation. 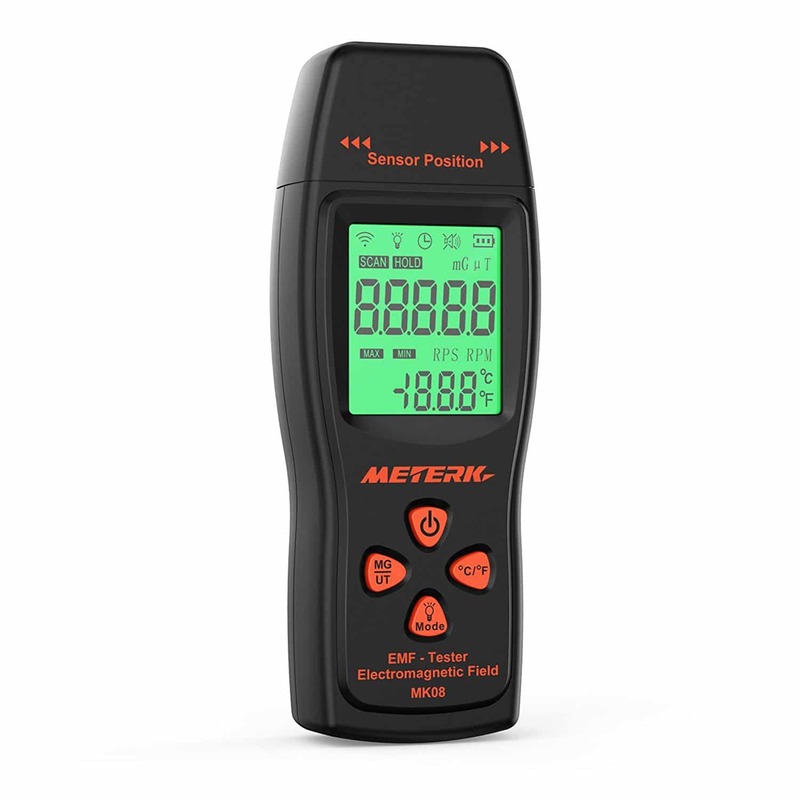 If you’re wanting a low-cost EMF meter, I really like the Meterk (read my review). Once you have your EMF meter, start by taking a measurement in the middle of your kitchen, at least 5 or so feet away from the unit. Try to determine if there is anything else that may be emitting a large amount of EMF radiation like your microwave. 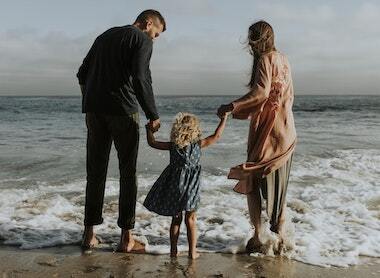 Then, once you’ve found a baseline, slowly approach your refrigerator with the device set to “magnetic” to get a reading of the magnetic radiation being emitted. You can then change the meter to measure other types of EMF radiation and determine if/how much it is emitting. Check out the video below for a great example of measuring EMF radiation from a refrigerator. Now in the video, it’s a smart fridge, and therefore is also emitting radio frequency radiation. The vast majority of simple refrigerator units will only emit a small amount of radiation, and it is fairly localized, meaning the farther you are away the less radiation you will be exposed to. Unless the unit is on the opposite side of a wall that you are sleeping against, I would not worry about this very much. There are far better ways to reduce radiation in the bedroom. However, if you do sleep opposite a refrigerator unit and would like to reduce or eliminate the amount of EMF radiation you are exposed to while you sleep, the best thing you can do is get some EMF radiation shielding paint. Take a look at my full review of Yshield paint for step by step instructions on how to do this. The best way to find low EMF refrigerator units is to take your EMF meter with you when you go shopping and measure the static amount of radiation being emitted. If you don’t want to do this (and I get it, it can be weird to take your Trifield to home depot), then look for simple units with no smart capabilities and no connectivity. Also, in general, more energy efficient the unit is, the less electricity it will use, and the less radiation it will emit. Although most simple refrigerators produce a very small amount of radiation (<1-1.5 mG), this will likely not be the case for long. 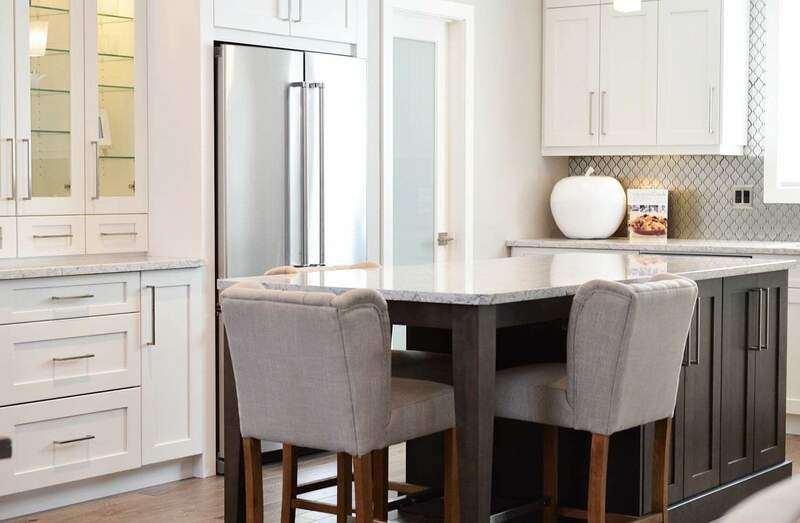 As smart refrigerators become more common and cost-effective, you will see them in more homes. These units produce exponentially more radiation than their basic counterparts, as they essentially house a highly connected computer on the door panel. All in all, if possible, choose the simpler, more energy efficient, less smart refrigerator for a safer home! I hope you enjoyed my article on Refrigerator Radiation, if you did, please consider sharing!